Human-Pig Embryos May Someday Supply Organs For Transplant : Shots - Health News Results from two sets of experiments provide encouragement to researchers working on "chimera" embryos that may someday be used to grow organs for transplantation into people. Cells derived from rat pluripotent stem cells were enriched in the developing heart of a genetically modified mouse embryo. Scientists are reporting the results of controversial experiments that they say are encouraging them to continue to try to develop embryos that are part-human and part-animal. 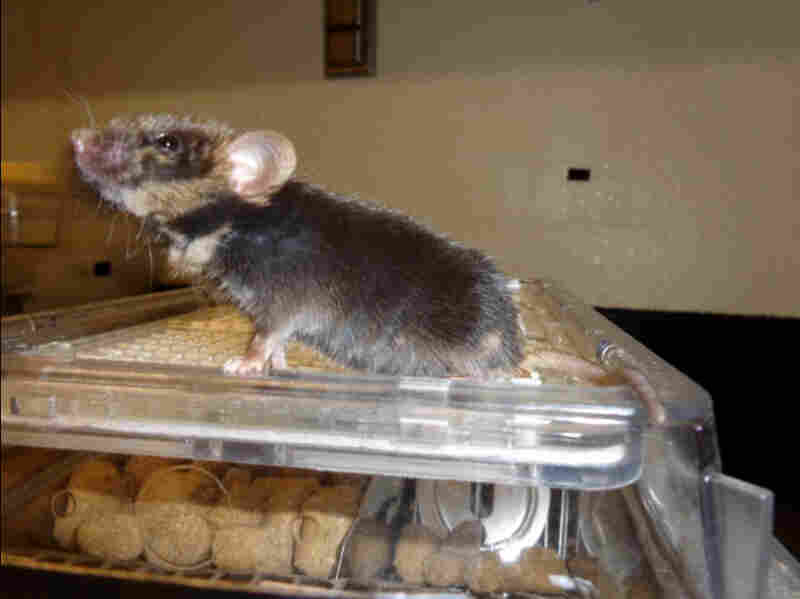 In a pair of papers published Thursday in the journals Nature and Cell, researchers reported that they were able to reverse diabetes in mice using mouse pancreas cells grown in rat embryos and were also able to get human cells to contribute to the development of tissues in pig embryos. 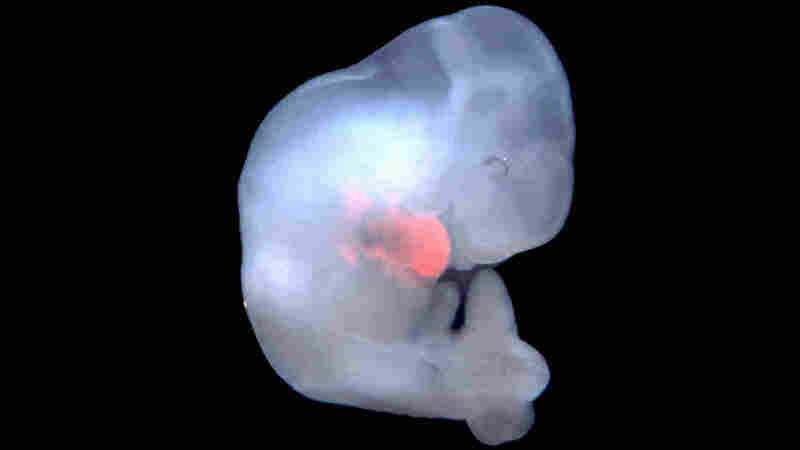 A 1-year-old chimera generated by injecting rat pluripotent stem cells into a mouse blastocyst. Brown in the coat indicates the rat contribution. Both experiments support the the kind of research that NPR profiled in May, the researchers say. Those experiments took the research to the next stage — using new gene-editing techniques to modify pig embryos in the hopes that human stem cells placed inside them might begin to grow into human pancreases. NPR subsequently broke the news that the National Institutes of Health wanted to lift a moratorium on funding such research. The moratorium was put in place because of concerns the research raised troubling ethical questions. The ethical concerns focused on the possibility the human cells could create animals that had human brain cells or tissues, blurring the line between the species. There are also concerns the cells could form human eggs or sperm in farm animals such as cows, sheep or pigs, and then those animals could mate. The NIH's plans to begin funding those experiments, however, wasn't finalized before the end of the Obama administration. It remains uncertain what will happen under the Trump administration. In an email, Carrie Wolinetz, NIH's associate director for science policy, said the agency's policy would be made final "after public comments are considered... Until that time, the moratorium remains in effect." She added, "There has been no discussion of this policy with the new Administration as of yet."